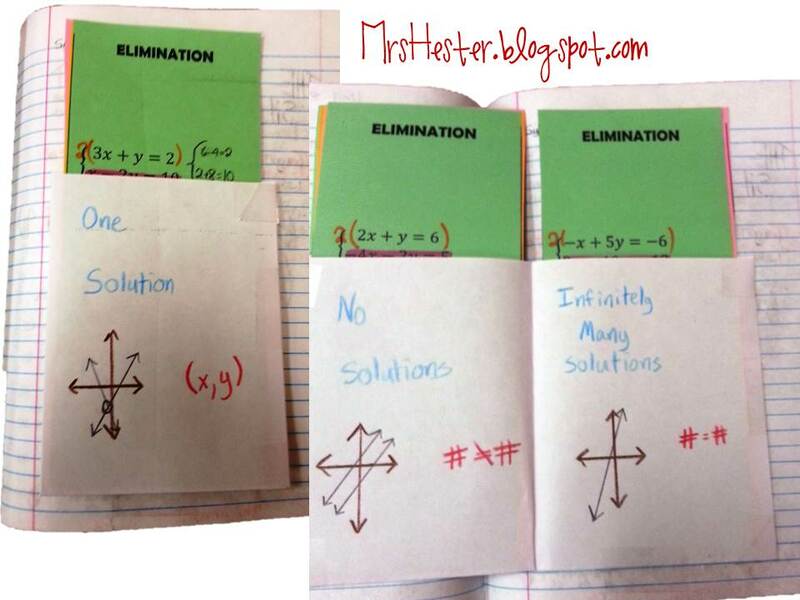 One of my favorite pages from this year was our Solving Systems of Equations page. In my opinion, this page was truly interactive. Students were sorting, classifying, and studying with these notes. YAY!! This page took a few days to complete. First, we discussed solving systems graphically. After some exploration and activities, we completed THESE notes (new file link that the bottom). They were still connected as one piece of colored paper. Students then put those notes away in their handy-dandy pocket. We came back the next day and completed notes over solving by substitution and solving by elimination (new file link that the bottom). Students then put those in their pocket as well. 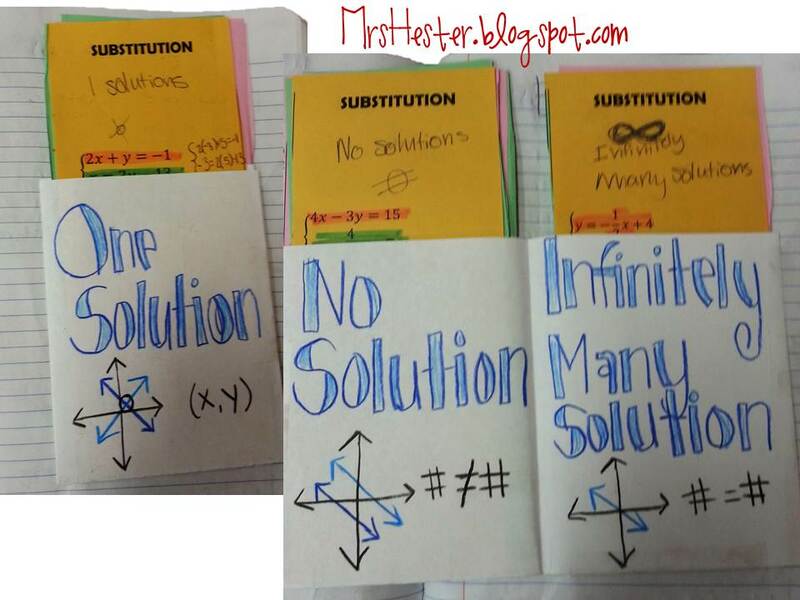 After making sure students were comfortable with solving systems, we started talking about one/none/infinitely-many solutions. 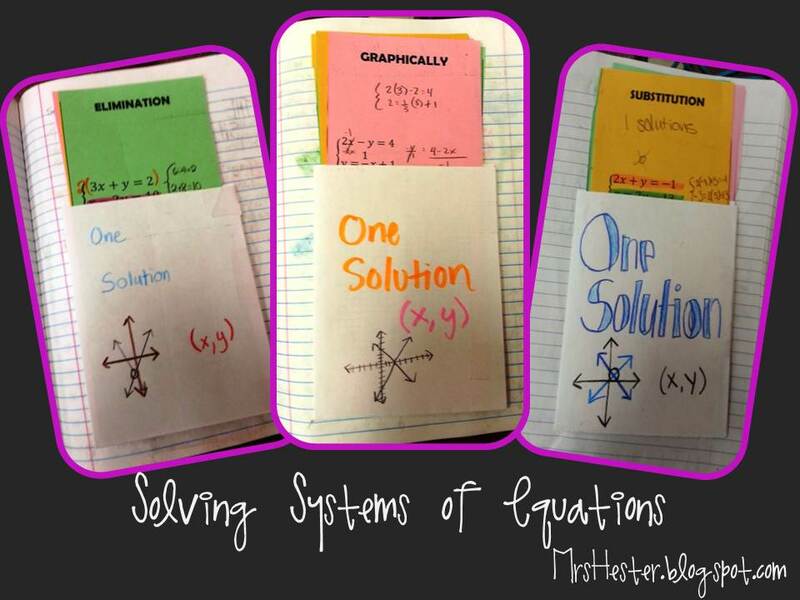 Students were already thinking about these ideas because each colored set (graphically, substitution, elimination) had one system with each type of solution set. Here's where the fun part happened! On page 103 of their notebook we took basic boring notes about what a system of equations is, the notation for a system, and what a solution point means. On page 104 we created a flipable pocket. The pocket is one full sheet and one half sheet of blank paper. Fold the full sheet in half width wise (hamburger style if you know what I mean) and then put the matching sized half sheet inside the larger, now folded paper. I know... it sounds confusing... it's really simple! Tape up the sides and fold the whole thing in half. You have four pocket areas. We only used three for our purposes. Do these pictures help at all?? Students cut their colored papers apart and sorted into three piles: one solution, no solutions, and infinitely-many solutions. They looked for themes and commonalities within these new groups. We then had a class discussion about their observations and added general notes to the fronts of each pocket. We visually represented how one/none/infinitely-many looks on a graph and the type of solution when solved algebraically. The sorting and processing part really made things click for students. I also saw them studying with these notes later. 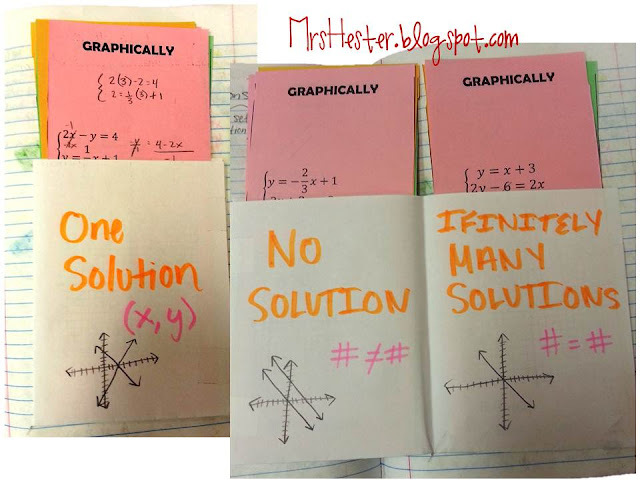 They were able to take out all notes of the same color to study how to solve with a given method, or take our all notes within a pocket to study solution types. How have you done systems of equations in the past? Any great ideas to share?? New links that should *hopefully* work! Thanks for sharing! You did an amazing job on the interactive notebook. Thanks Alana! Will you be trying them next year? I'd be happy to swap ideas between schools next year with you! 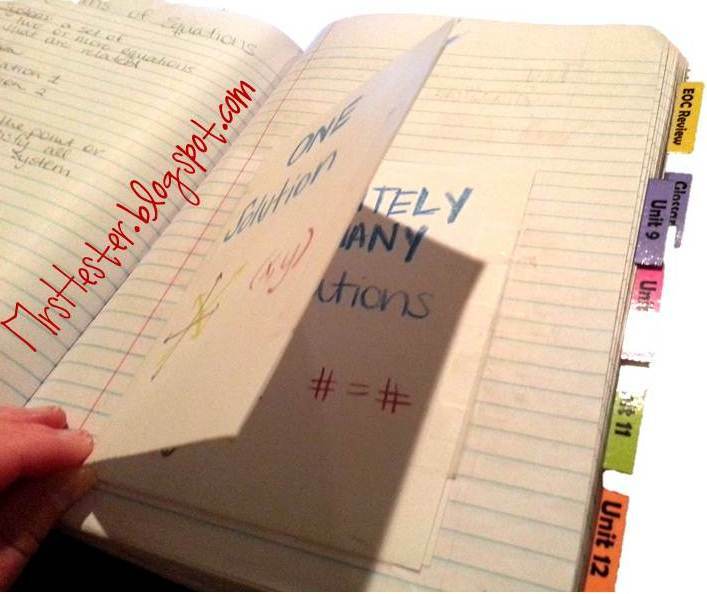 Love how you made this sorting activity a part of you interactive notebook. I will definitely keep this in mind for my 6th graders this school year! Thanks for sharing! Glad you liked it! I would definitely recommend it - and so adaptable for any content. Are the cards available as a printable? I love the idea! Are the files still available for download? What a great idea! I would also like the files if they are still available! I agree! This is awesome. Are the files still available? Thanks! Love this! Are the files still available? The links to the files are broken. Any chance of re-linking them? Sorry everyone, I have placed new links at the bottom that hopefully work now!! Feel free to download and use. I'd love to hear how you tweaked it and made it better! This looks awesome. 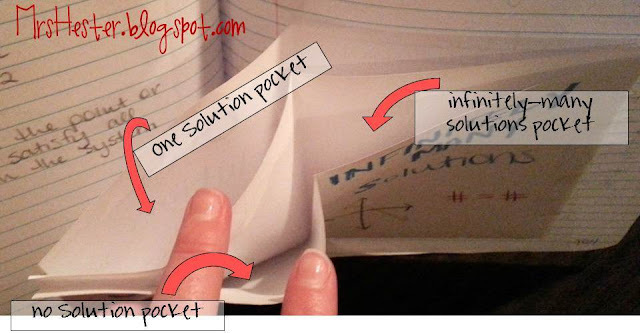 Just to make sure I understand, there are three sets of pockets for one solution, no solution, and infinite solutions? or one envelope for all three? I have used your foldables in the past and I cannot find my original or where I saved it. I have been trying to download the pdf forms to not avail. Is there any way you can share those electronically? If you can: normasolano46@gmail.com Thanks! Can you post your notes here as well?